Bracelets are truly a universal decoration,Which equally can enjoy both men and women. These accessories can be massive and expensive, made of precious metals and precious stones, or they can be hand-made products that delight in primitiveness and brightness. Since the simplicity of clothes, hairstyles and ornaments is now in vogue, weaving bracelets from laces becomes a popular kind of needlework, which we will discuss in this publication. Before you make such a bracelet of laces,You need to buy four thin strings of silvery color and one black medium thickness. The length of the latter should be such that it freely covers the wrist, but does not hang or press. Initially, you must leave a littlePlaces for future fastening. Place the black workpiece in the middle, and along its sides arrange a pair of silver cords, from which you will have to weave a pigtail around the black lace. To do this, a pair of shoelaces should be started under a black base, crossed and tightened tightly. Similar manipulations are performed on the otherA pair of threads. Then, taking one silver cord from each side, we cross them over black, again tighten and weave this technique to the end. If everything is done correctly, then at the end of the work on both sides of the black thread will hang the ends of the silver. Now a piece of skin should be cut out a squareSuch a size that it fit a small button. In the box, holes are made, in them, through a pair of silvery laces, which are then tied to a strong knot directly on the black thread, and all the excess is cut off. On the front side, the button itself is sewn. At the second end of the bracelet with their own hands and from the tips of silvery cords, a loop that fits tightly around the button so that the product does not unfasten. To make such an accessory you will needCords of different colors, each of which can have its own meaning. 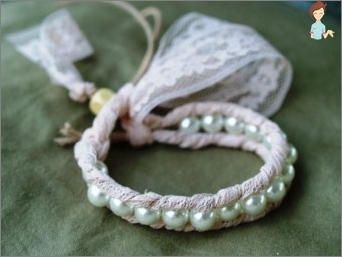 After this, it is necessary to establish the length of the future bracelet, which is multiplied by 4. All laces are connected by a strong knot, afterWhich you need to leave a little space for the future string. The interestingness of this scheme is that you can weave a bracelet of the thickness you want, for which you just need to increase the number of threads. From the remaining material, tie a pigtail. Before we weave such a bracelet out of laces,It is worthwhile to know that its appearance can be diversified as follows: the laces need to be added to the middle on each side, after which the resulting arrows are connected by a knot. Schemes weaving bracelets from leather laces giveThe opportunity to get a solid and noble looking decoration, which can be worn not only on the wrist, but also on the ankle or above the elbow. To make this accessory with your own hands, prepare a pair of thin strips of leather and three strings of a similar material, which will be intertwined. As a fastener can make a silverA carbine or an ordinary bundle of leftovers. The number of strips is chosen based on the desired thickness of the bracelet. The ends should be connected from one end, after that wind this place with a thin leather strip and tie it stronger. To make the article more neat, all the thin tails are hidden in a knot of thick threads. Next, bracelets from leather laces, whichMade by hand, should be weaved in the form of an ordinary pigtail, achieving the desired length of the product. The second end is fixed in a similar way, that is, using a thin strip of base material. Initially, you need to purchase several beads and a pair of threads of the right color. The latter are aligned, a small margin is made from the edge, and the knot is tied. Now one of the shoelaces, which will be working,It is necessary to wrap the main thread in the direction from left to right. A thread is threaded into the resulting loop, and the formed bundle is pulled up a little. It may seem that this is realPuzzle, in practice everything is much simpler. Similarly, a second knot is knit, which is gently tightened and moves close to the first one. It turns out that the main thread is the thread that has been working before. It remains only to complete the decoration to the end, constantly changing the role of cords. 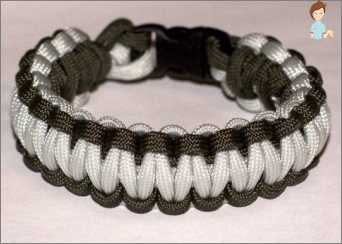 Finally, we note that creating bracelets from multi-colored laces and beads, the latter can be placed both in a chaotic order, and in a clear sequence. 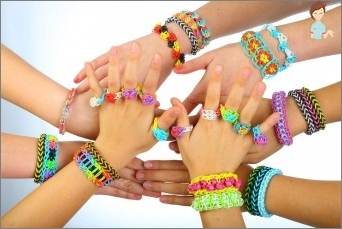 Considering the fact that primitiveness andEase in the image is again at the peak of fashion, the emergence of many schemes of how to weave bracelets of beads and laces, is fully justified. All these methods can be changed on demand, allowing you to get really unique and relevant jewelry.